For many people, mobility is something that is taken for granted. For others, it is a luxury. People with a joint disorder quickly become aware of their limitations. So they seek professional help and count on support and expertise. A good brace guaranteeing freedom of movement may provide a solution. Push is familiar with the wishes of those who issue prescriptions, as well as the professional trade and end-users. It continuously searches for the best solution to increase the ability of the locomotor apparatus to function under stress. It exhaustively tests new braces under the guidance of physicians and scientists. It examines materials and focuses on design. The result is a range of advanced Push braces, all applying a distinguished concept based on optimum support, compression and attachment to the skin. 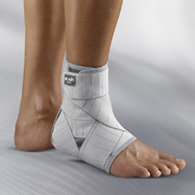 They provide functional solutions, restoring the physical ability of the affected joints to function under stress. These solutions serve the user well. Push braces are comfortable to wear and simple to use. These are essential aspects of the ultimate effectiveness of the product. New high-quality materials, such as Sympress™, ensure a high degree of wearing comfort and durability. The attractive design of the braces enables the user to reintegrate into society, which also goes hand in hand with the improved mobility, of course. Push products can be used for a wide range of cases and conditions, offered in three profiles: care, med and ortho.